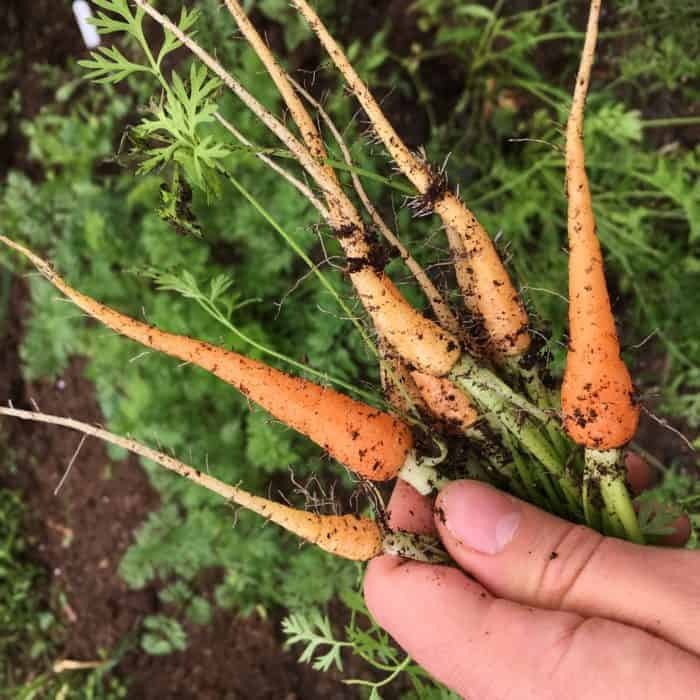 This post will help teach you how to grow your root vegetables, and decide which ones are the best to grow in each season. Most root vegetables prefer cooler weather so the summer heat can be a challenge. Some root vegetables like radishes grow fast, others take 100+ days to mature. Timing your sowing dates can be hard to figure out, so I’ve created a season guide for you. 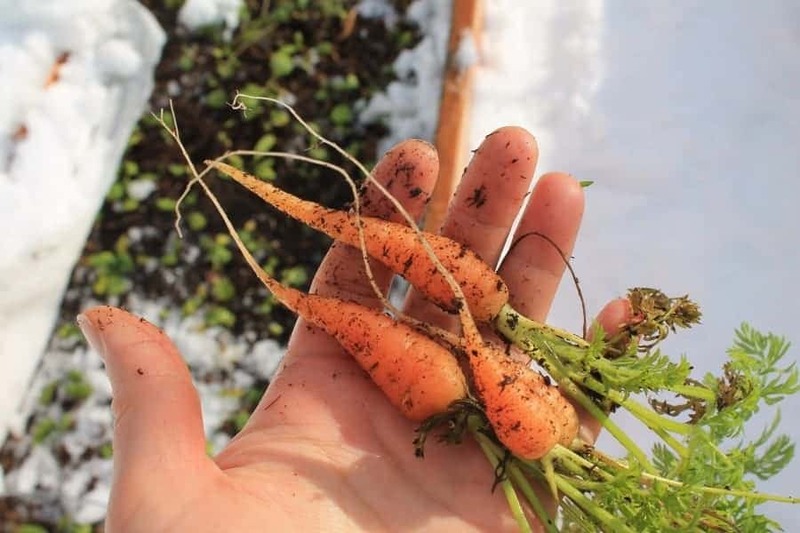 There are even root vegetables that taste sweeter after the fall frosts, and some you can harvest during the winter months even in snow. 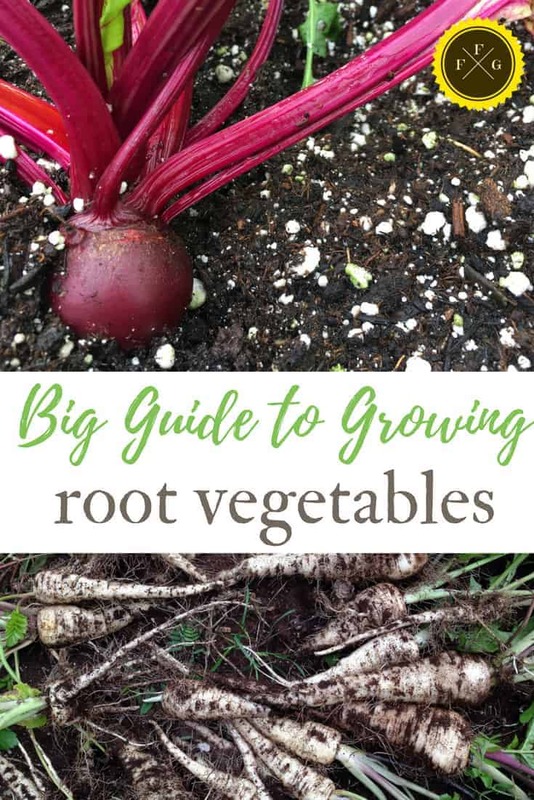 This is an in-depth post on growing root vegetables so stick around! Some people classify vegetables as ‘roots’ if they are grown underground. Others also include crops like onions and garlic (bulbs), or tubers like potatoes, yams and sweet potatoes. 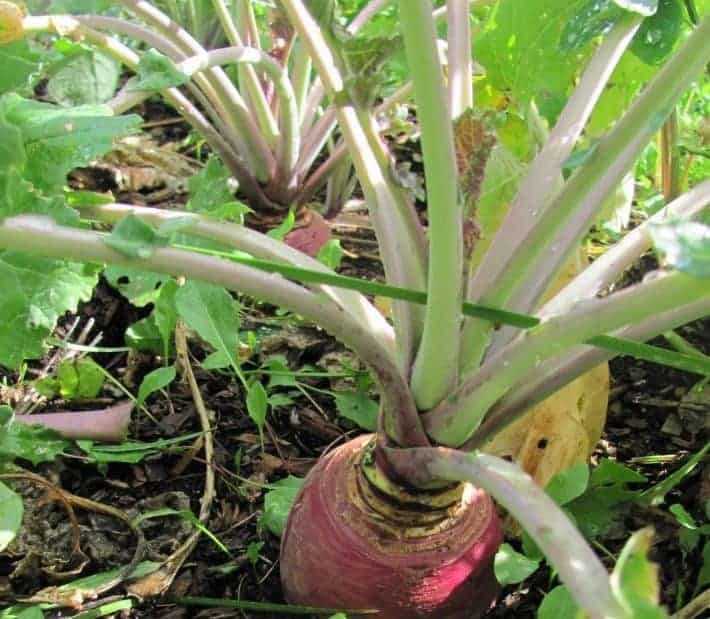 This list of root vegetables are root vegetable crops that mostly grow underground (although you see see turnips, rutabagas and beets tend to grow above too). You can also eat the leaves/tops of many root vegetables! 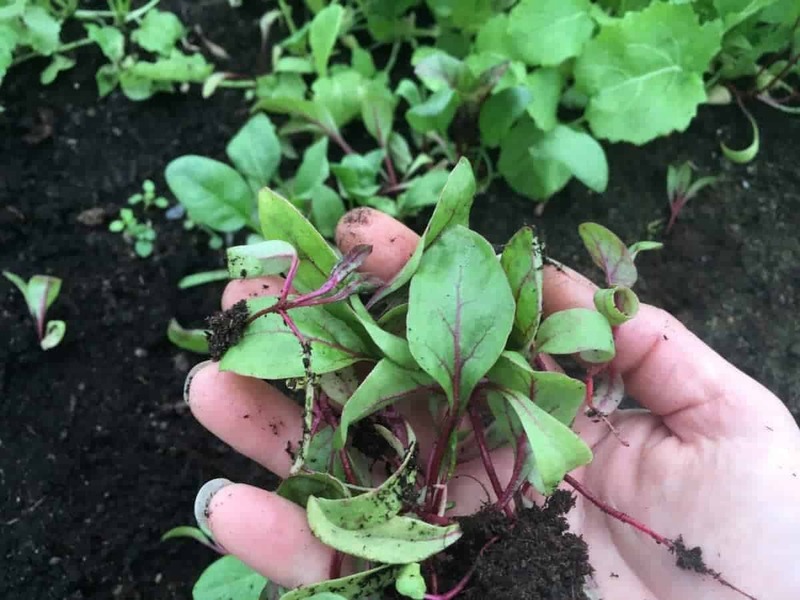 Beet greens are great, as are certain turnip varieties for leaves. I’ve even see carrot top pesto! 4 to 6 hours of direct sun a day. Deep well drained soil. Root veggies struggle in clay soils. Root vegetables like deeper soil for larger sizes. Soil doesn’t need to be ‘rich’. Root veggies are great to crop rotate after nutrient rich veggies. Phosphorous and potassium for root growth. Too much nitrogen will produce large green tops instead of root development. Beets appreciate extra boron. Azomite trace minerals are great to add to your soil. Consistent watering, they dislike drought. THIN OUT SEEDLINGS. Learn how to here. Not thinning out root vegetables is one of the biggest mistakes people make. That means you need to directly sow your seeds into the garden instead of growing a plant indoors to transplant outside. You should also practice succession planting with many root veggies, which means instead of sowing once, you plant seeds multiple times throughout the season for spread out harvests. Challenges tend to be the heat not the cold. Too much nitrogen will result in leafy tops and poor roots. There are also many root pests like root maggots that will eat up the roots and make them not useful. We have rodents (specifically meadow voles) in our garden that eat the root veggies. We lose a fair amount unless growing them in raised beds with hardwire underneath so that can’t burrow upwards. Aphids can eat the leaves of rutabagas and I’ve lost many turnip leaves to tiny black flea beetles. Sometimes slugs can also damage root vegetables. Carrot fly can affect carrots, you can plant resistant varieties or use row cover. Some roots taste great in the fall after frosts. Others you want to grow quickly in the spring to get harvests before the heat sets in. Root vegetables in general prefer cooler weather. Varieties make a BIG difference, be sure to look at seed packet mature dates. I keep record and create planting schedules with this printable garden planner. Which is the Best Method to Grow Potatoes? Here are some root vegetables to grow in the spring. These will be ready in 1-3 months from sowing. You can sow many root vegetables before your last frost dates, often 2-3 weeks before last frost. If you use hoop tunnels you can get an earlier head start too. Radishes are great in the spring but can bolt quickly (try to go to seed). Sow 1-2 a week until mid-May. 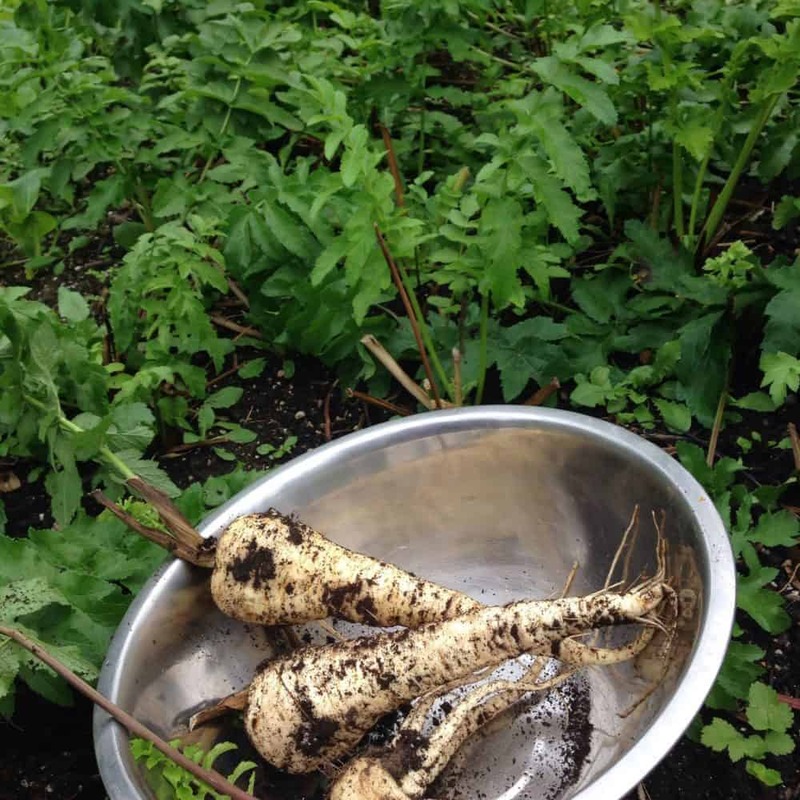 Don’t bother growing larger daikon radishes where the weather gets hot quickly. Sow your root vegetables that take 100+ days to grow. These include parsnips and rutabagas, as well as certain large carrot varieties. Thin out your spring sown root veggies so they have enough space to grow. 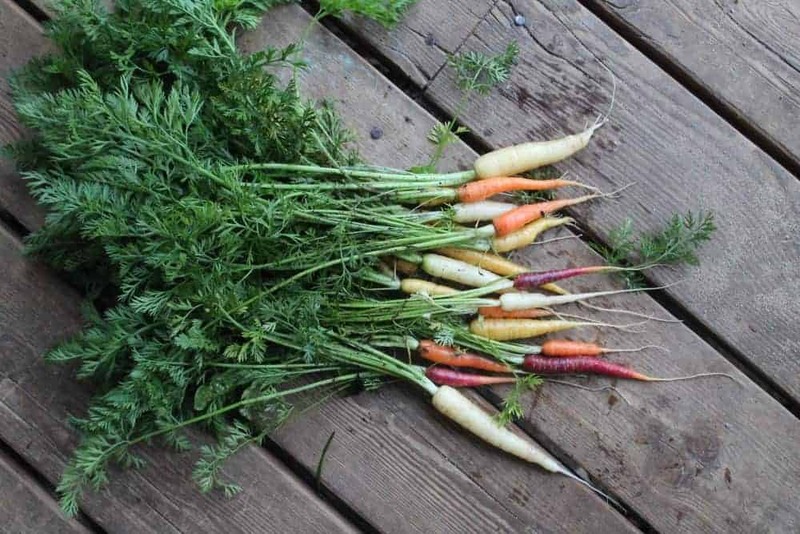 You can eat baby carrots and beets for example, or compost them if they’re too small. Sow another round of beets. 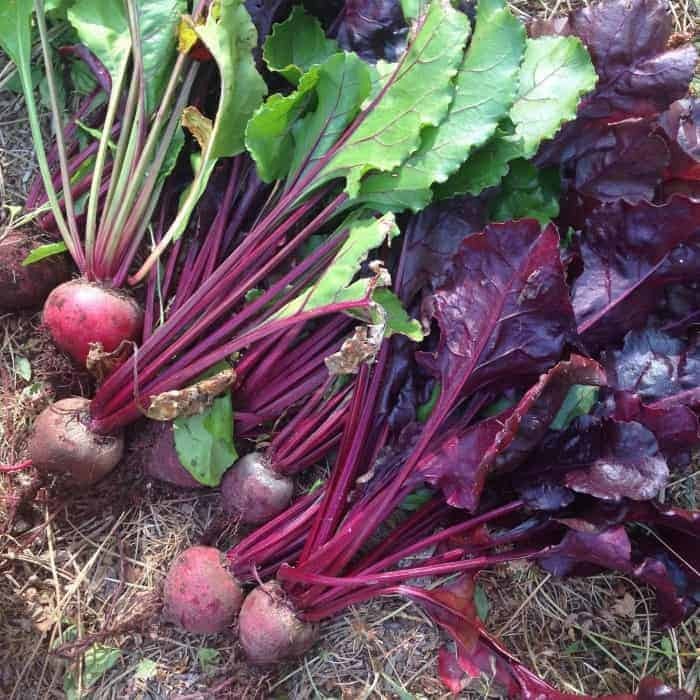 Growing beets that will be ready quickly in 60 days and grow longer maturing ones ready in 80 days. Beets will get larger if left in the soil, but can get woodier. Baby beets will stay very tender. 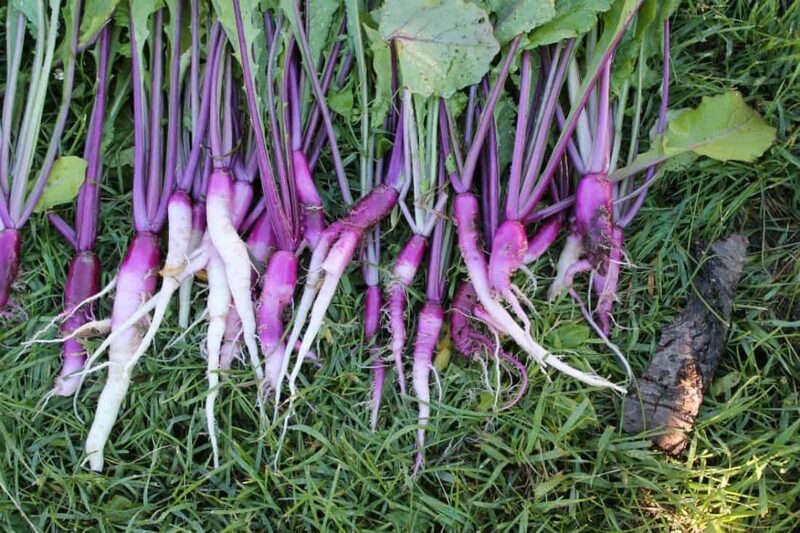 Grow turnips to harvest 60-80 days later like purple top turnips. 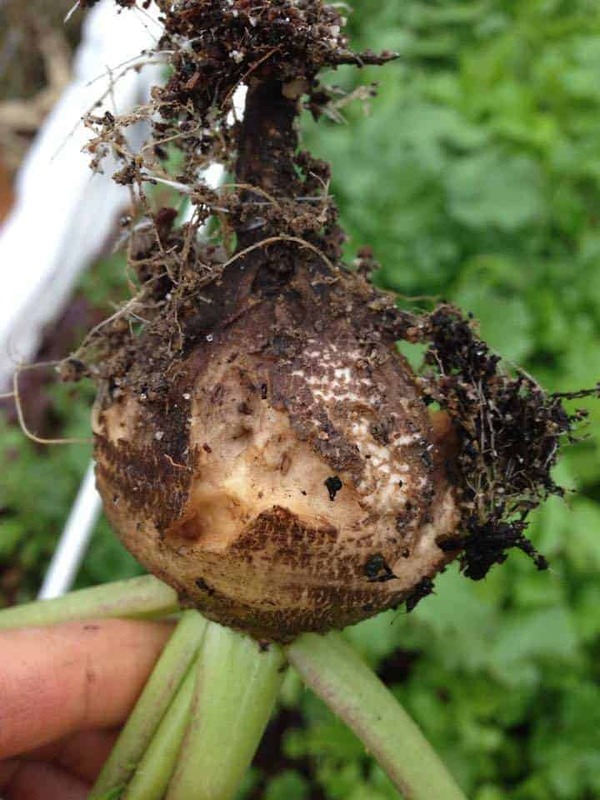 Below is the unusual ‘Hinona Kabu’ Heirloom Turnips. This is the time you’ll be harvesting many of your root vegetables. 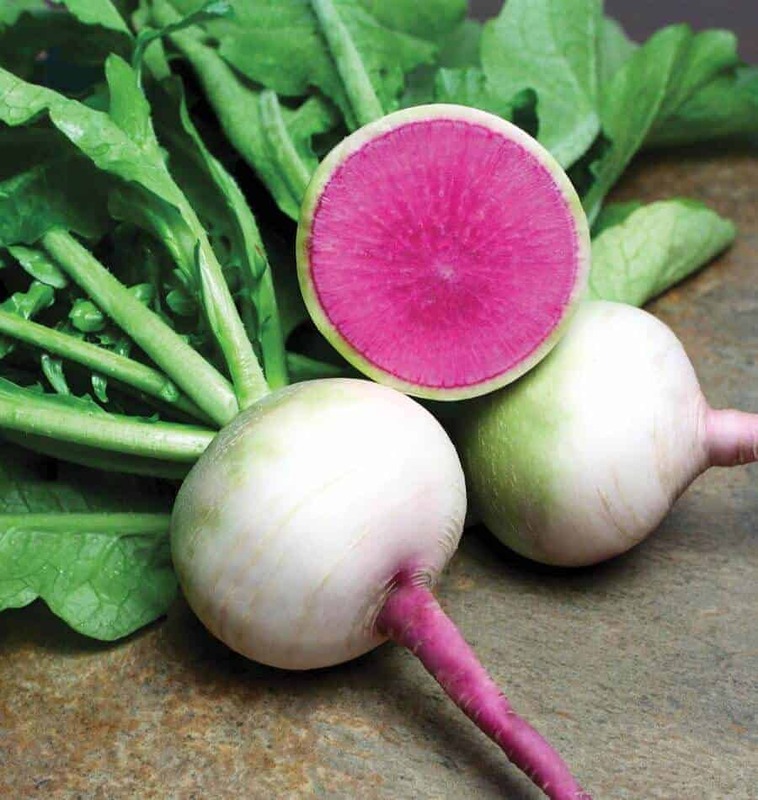 If you have a longer growing season you can sow another round of baby turnips, baby beets or carrots. If you have cold frames you can definitely sow shorter growing ones. My favorite cold hardy carrot variety is a hybrid called Napoli and they’re ready in 55 days. 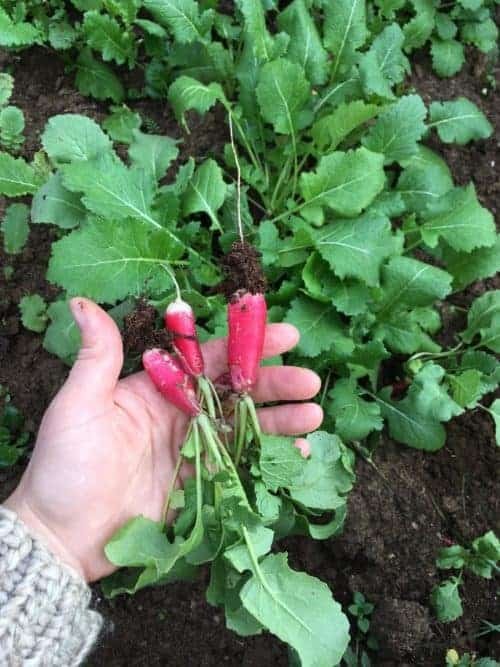 You can also sow more radishes at this time, focusing on winter radishes like daikon, black spanish round and China rose. Root vegetables like parsnips and carrots actually taste sweeter and better with frosts! The challenge isn’t always the cold, so much as the frozen ground that makes them impossible to harvest. 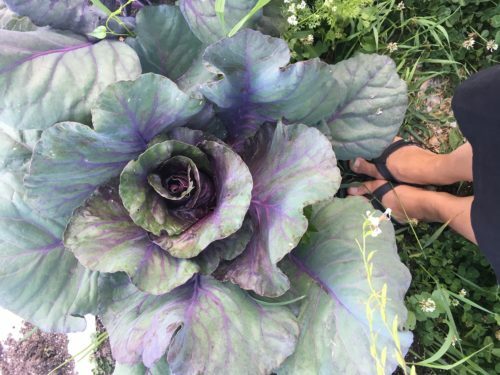 Growing them in low tunnels, cold frames or unheated greenhouses. Adding a layer of straw and a tarp can help protect root veggies like parsnips or carrots to harvest during the winter. Other time I wait for a mid winter thaw which sometimes happens in January or February here and harvest then. If you have a mild winters you can harvest these the whole winter. If you do get lots of snow, you’ll need season extenders. Where we live we don’t get the deep freezes or deep snow until December, so we often can harvest lots before the holiday season. In Jan and february it reaches -20C/4F so I wait until the ground thaws. 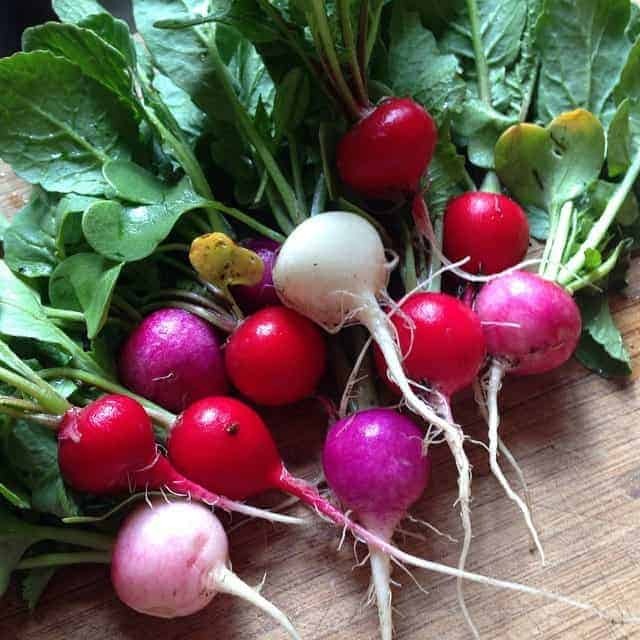 Winter radishes like China rose or daikon or Starburst watermelon radishes. I also sow regular radishes and harvest before the deep cold sets in. 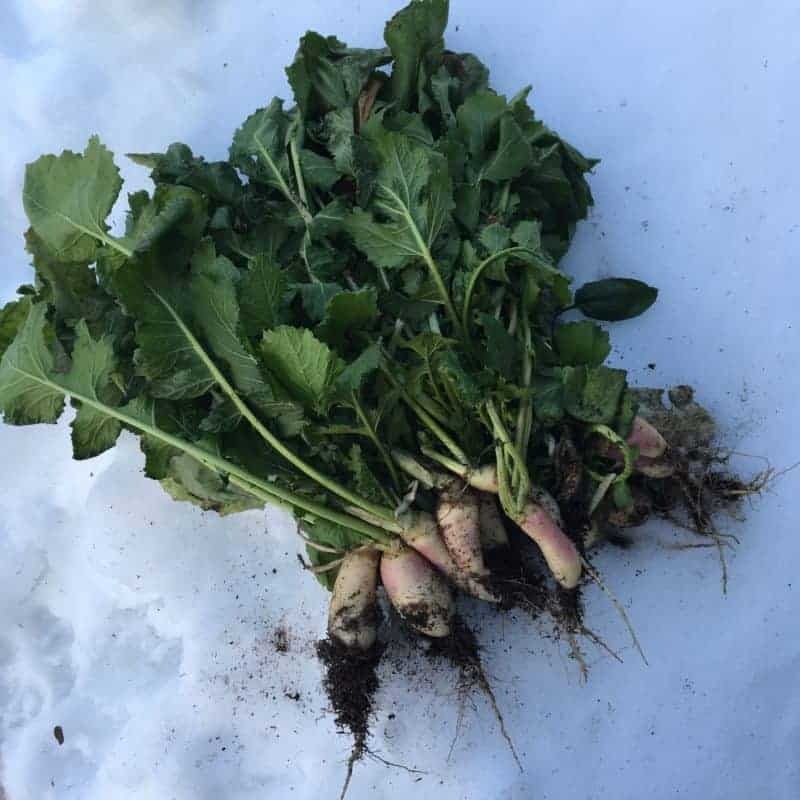 Winter radishes are cold hardy, regular radishes are frost tolerant. Overwintering root veggies are harvested early spring. You can overwinter parsnips and carrots. 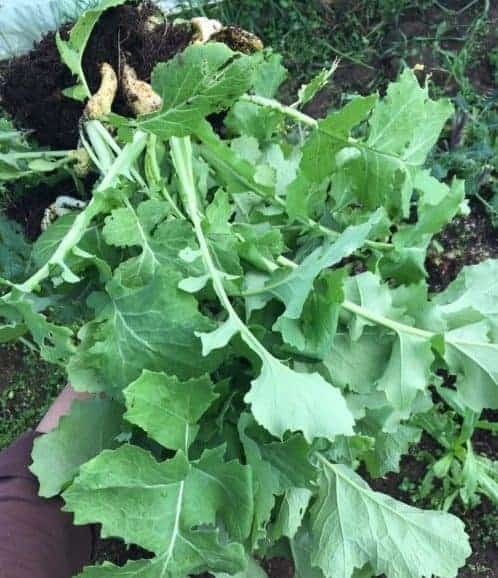 We often overwinter turnips for the prolific greens in the spring, not so for the roots, but the chickens love them and it reduces feeding costs. Below you can see purple top turnips that were harvested in January in zone 5 Canada from an unheated winter greenhouse. 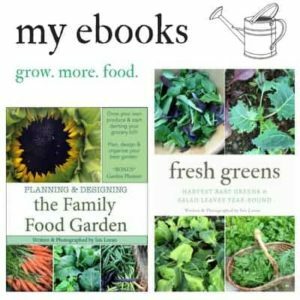 I hope this post helped you grow root vegetables! 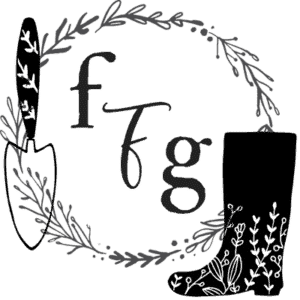 Hungry for more year-round gardening posts?